Swimming is a natural and wonderful activity that most children love, however they can develop fears and phobias for all sorts of reasons. With a fear of swimming, it's usually due to a panic experience in the past or a learned fear from someone else who was in the water with them at the time (or even just an incident that they've read or heard about). Whatever the reason, this fear is best overcome in childhood, not just because they're missing out on good exercise and fun but also it could save their lives one day. 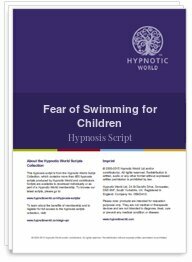 This Fear of Swimming for Children hypnosis script from Hypnotic World is suitable for both sexes and children will love the visual imagery and relaxation experience. Download this Fear of Swimming for Children script today to help your child clients to learn and love to swim.